Barrels is a storage plugin which allows for mass storage of a single item. If you are used to modded Minecraft they function much like draws. Items can be transferred to/from not only your inventory but also from a shulker box if held in your main hand. 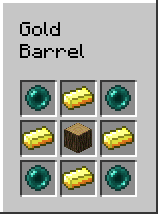 Use (right click) while sneaking (shifting) to put all itemstacks from your inventory which can be stored in the barrel into the barrel. Note that if the barrel is empty when this is done the item from your main hand is used to set the item for the barrel to store. Use (right click) when holding a shulker box to put one item stack from the shulker into the barrel (again if the barrel is empty this will also set the item to be stored in the barrel). Use (right click) while sneaking (shifting) when holding a shulker box to put all the item stacks from the shulker into the barrel. Punch (left click) to take one item out of the barrel and add it to your inventory. Punch (left click) while sneaking (shifting) to take up to one item stack out of the barrel and add it to your inventory. Punch (left click) when holding a shulker box to take one item out of the barrel and add it to the shulker box. Punch (left click) when holding a shulker box while sneaking (shifting) to take up to one item stack out of the barrel and add it to the shulker box. To lock a barrel simply run “/barrel lock” and punch (left click) the item frame of the barrel. To unlock a barrel simply run “/barrel unlock” and punch (left click) the item frame of the barrel. 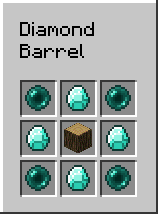 Use the “/barrel info” command and punch (left click) the item frame of the barrel and it will show in chat information about the barrel including its type and maximum storage. Find that your barrel is full and/or you want to change its look? Hold the barrel you want to replace with in your main hand and use it (right click) in the item frame of the barrel. The old barrel will be returned in your main hand and no mess trying to take out and replace items! In addition barrel controllers can take items from inventories (chests, hoppers etc) which are connected to any face and automatically store them (items which are not store-able will remain in the input inventory). The controller has a network strength of 15, barrels connected directly to a face of the controller will have a strength of 14, further barrels can be connected to the faces of the barrels each time there will be a drop of signal strength of 1. Any barrels which have no signal strength will not be part of the network. Confused? In short place barrels adjacent to each other and the controller, ideally putting the controller near the center of the barrels. Note that you can connect on the front back faces of a barrel so you don't need to make a flat wall of barrels! To which barrels are connected to a network use the “/barrel connected” command and use (right click) the controller, all the item frame of connected barrels will then “glow”. Use (right click) when holding an item to put the itemstack in your main hand into the a barrel within the network. The controller will attempt to add items into a barrel which is already storing the type of item being stored first. If there are no such barrels then the controller will find an empty barrel and store it in there instead. Use (right click) while sneaking (shifting) to put all itemstacks from your inventory which can be stored in the barrel network. As outlined above this will add items to empty barrels as required. Use (right click) when holding a shulker box to put all the item stacks from the shulker into the barrel network.